Developer Galope took a break from working on Meawja to release a short and charming sidescrolling platformer called Ravva and the Cyclops Curse. The game stars a little owl girl named Ravva whose mother, a summoner, was defeated and turned to stone by the evil Cyclops Lord, Now the owl girl summons creatures of her own to defeat the villain and restore her mother's essence. 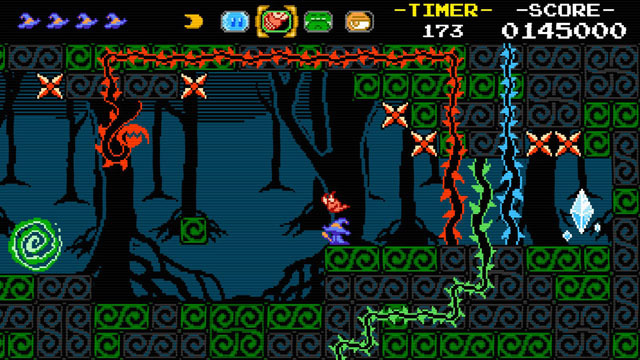 Ravva is able to control four creatures, each with different abilities, allowing her to freeze enemies and objects, launch projectiles into the air, drop explosives, and find secret items like 1UPs, more powerful projectiles, a limited use shield, or caches of coins. The game can be beaten in a couple of hours, but there are a few secrets to be found, and players can make a dedicated score run.